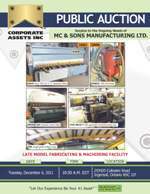 Corporate Assets Inc. | MC & Sons Manufacturing Ltd. - Corporate Assets Inc. FEATURING: HACO (2001) HSLX 3013 hydraulic shear, PROMECAM RG3000-100 hydraulic press brake, HYD-MECH (1997), M-20A automatic horizontal band saw, ASQUITH/ARCHDALE POWERTHRUST 6’ radial arm drill, SWL single girder bridge crane, MARCO (2006) M65 shot blast, FIRST LC 1 ½ VS vertical turret mill, BUFFALO No ½ mechanical ironworker, HEATH ULTRA GRAPHIC RC 48” X 60” oxy acetylene shape cutter, (2) PANASONIC GUNSLINGER 261 MIG welders, GARDNER DENVER 30 HP rotary air compressor,YALE 3000 lbs. electric pallet lift, 20’ X 20’ X 13.5’ paint booth, 95” X 29” stroke sander, and more.